By every indicator, Idaho’s oldest and youngest workers were more affected by the recession than any other age group. Teenagers in Idaho lost 35 percent of their jobs while the oldest workers managed to find more employment opportunities even as hiring overall slowed dramatically. The competition between older and younger workers intensified during the downturn. Older workers were taking jobs that younger employees traditionally held and employers took advantage of what they viewed as a more reliable and experienced workforce. Nearly half of the Idaho jobs lost to the recession were in construction. The more established construction companies rely on more experienced workers in the specific trades. 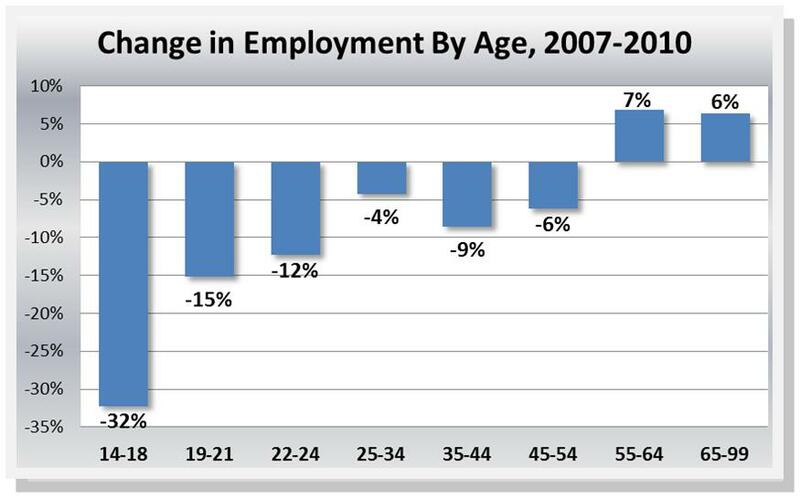 In 2007, the construction industry labor force was heavily concentrated in the 25 to 34 age group. That changed significantly as the housing market collapsed. Most notable was the increase in 55- to 64-year-old construction workers. That group jumped from 9 percent of the labor force in 2007 to 13 percent just three years later. They were the ones who survived the drastic cuts the recession forced on contractors. A similar trend surfaced in manufacturing, which suffered the second most job losses in the state – 24 percent – from 2007 to 2010. Retail trade also saw a decrease during the recession, losing 15 percent of its jobs, followed by accommodation and food services and administrative and support services, both at 9 percent. 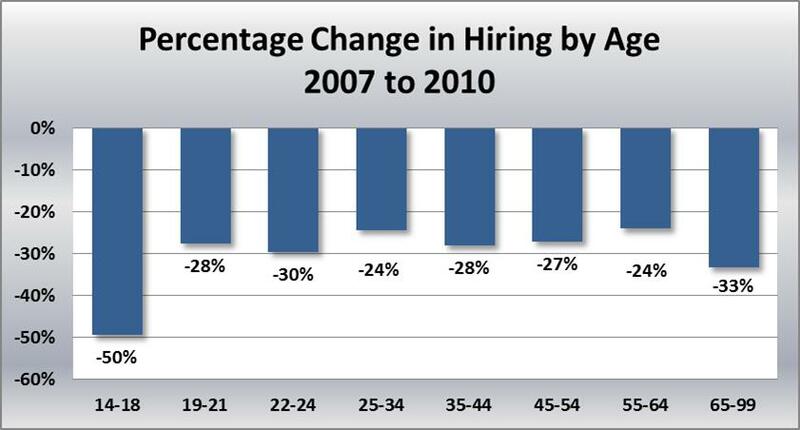 Each experienced younger workers being replaced by older ones. The accommodation and food services sector —which includes restaurants, bars and hotels — employed the largest contingent of younger workers and saw a significant decline. The number of teenagers aged 14 to 18 dropped from 20 percent in 2007 to 12 percent in 2010. Not only was this share of industry employment taken over by older workers, but also workers just up the age ladder from the teens moved into these jobs. The job losses the Gen Y’ers, those aged 25 to 34, suffered in manufacturing and construction – and to a lesser degree the 55- to 64-year-old population – forced them into jobs in other sectors even if the paychecks were smaller. Accommodations and food services as well as retail trade were the targets, and because of that those two age groups were the only ones to essentially increase their employment base in the sector.